Tuesday: Nixon goes to China (uh, Merkel goes to Greece). There are no US economic data releases scheduled on Tuesday. Last year I wrote Labor Force Participation Rate: The Kids are Alright. I linked to some data on the impact of the phase out of lead in gasoline and paint, and how this could be leading to more enrollment in school. 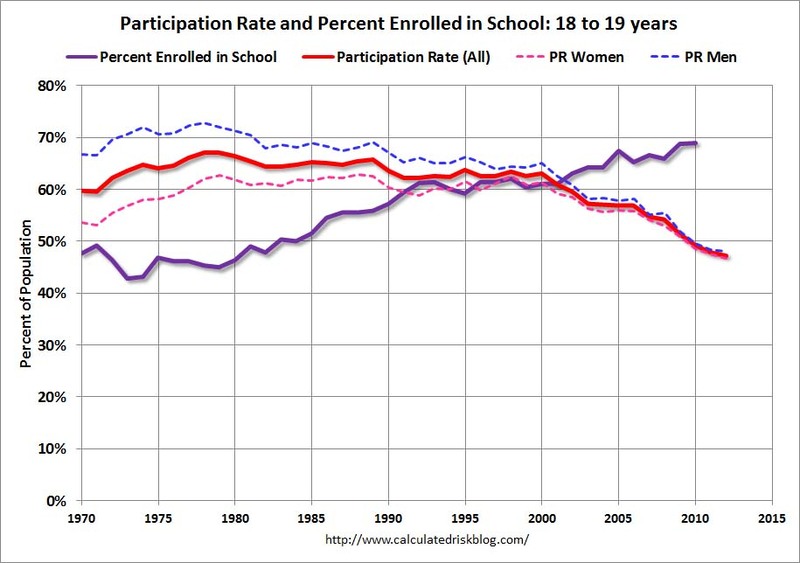 Of course higher school enrollment is the mirror image of a falling participation rate for young people (see graph below). This graph uses data from the BLS on participation rate (through September), and the National Center for Education Statistics (NCES through 2010) on enrollment rates. 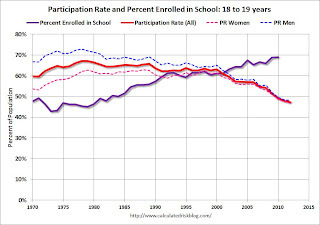 This graph shows the participation and enrollment rates for the 18 to 19 year old age group. These two lines are a "mirror image". If reducing lead exposure is the reason for the higher enrollment rate - and lower participation rate - that would be a great success! In the long run, more education is a positive for the economy (although I am concerned about the surge in student loans).